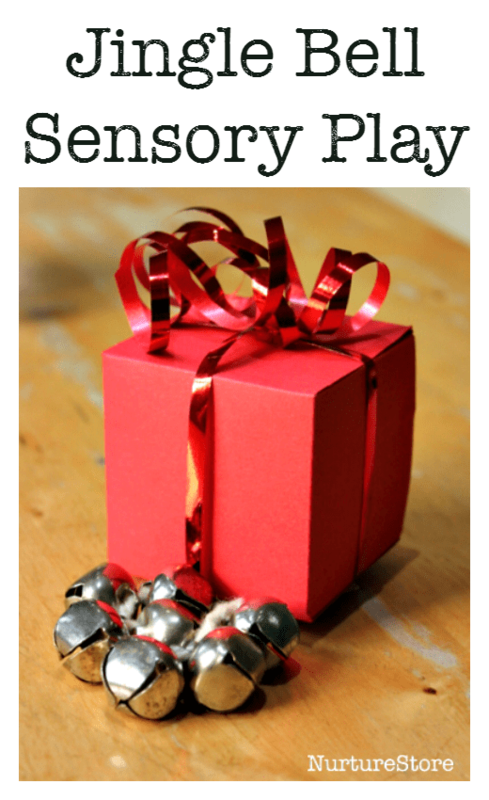 This week’s Christmas sensory play ideas are exploring our sense of hearing. Here are some fun, festive listening games you can play with your child. Both my daughters love making noise. But it’s also important to encourage children to develop their hearing skills, so they can listen very carefully – and not only so they will always listen to you! Our Christmas listening games use little parcels of sound. They’re easy to make and there’s a selection of play ideas and games that you can use them for, to suit children of different ages and stages. To play the games, you’ll need a few small gift boxes. You can buy a set from the store but there’s also a super site called Template Maker which will design a printable template for just about any shaped gift box you want. 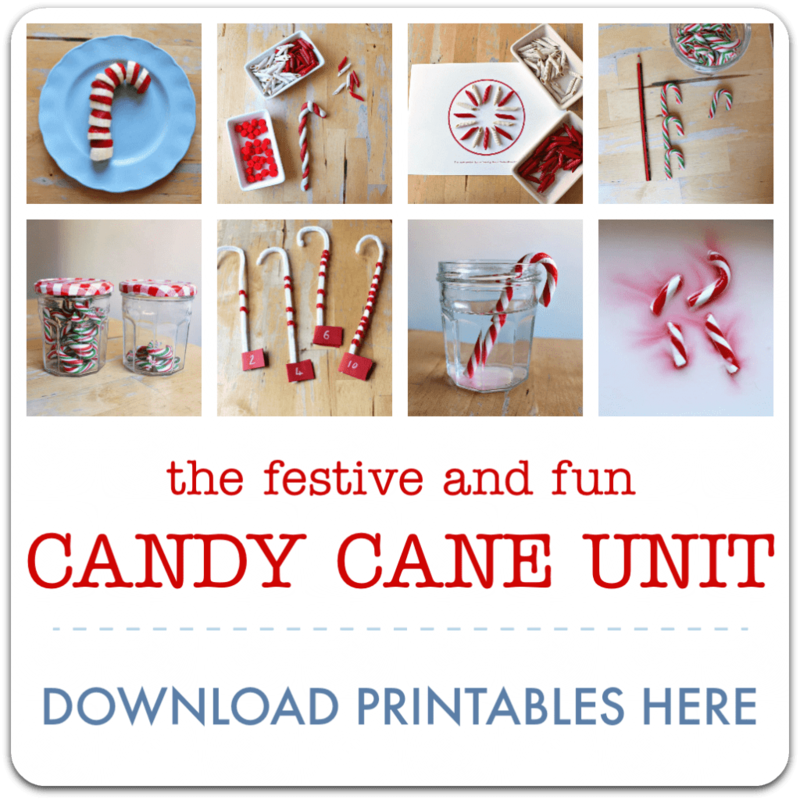 Click through, type in the size of the box you want – I used a 6cm square for this set – and then you can print a pdf template of your box. I used mine to trace round onto thick card, but even easier would be to put the card in your printer and print the template directly on to the card. You’ll need some sounds to go inside your boxes. Think about what you have that will make an interesting noise as it rattles around in the box. You could use dried rice, pasta, corn, chickpeas, fir cones, wooden rings, large buttons, Lego pieces, cotton reels….and of course some jingle bells. You’ll need to make sure the items you’re using are suitable for your child, especially if you have a younger child: use items that are big enough not to pose a choking hazard, secure the items safely (you could sew them inside a little fabric pouch) or make sure you fasten up all the sides of the boxes with glue or tape. In any case, you’ll need to supervise all the time your child is playing with the boxes. Place a different sound inside each gift box, fasten the box securely, and add a little bow to make your seasonal-sounding Christmas presents. :: Set the boxes out on a discovery table or in a treasure basket and invite your child to come and explore. What can they hear inside each box? Can they guess what’s inside? 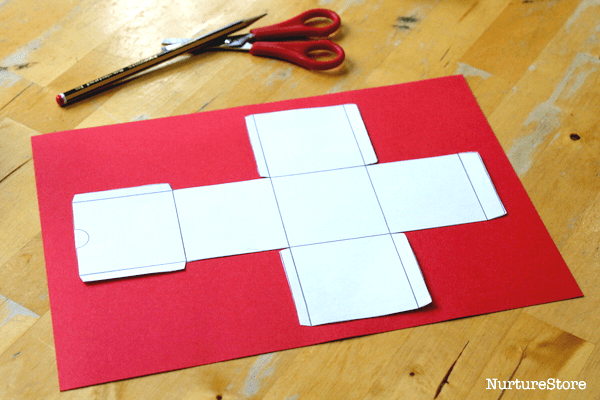 This is a lovely activity for babies and toddlers. :: Hide the gift boxes around the room and go on a sound hunt to find them. :: Add in some numbers and play a ‘Where are the Jingle Bells?’ guessing game. Take three boxes, all of the same colour if possible, including one with the jingle bells in. 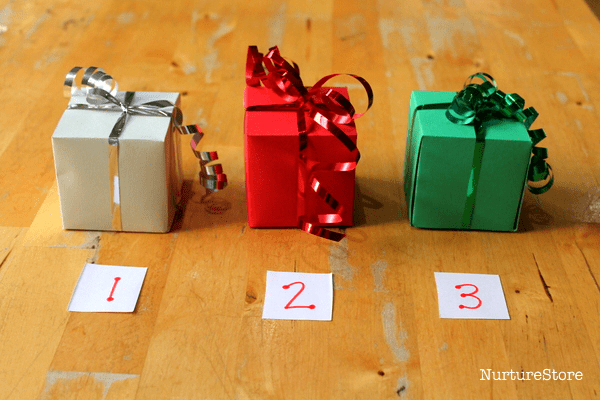 Count your boxes and place number cards next to them: 1, 2, 3. 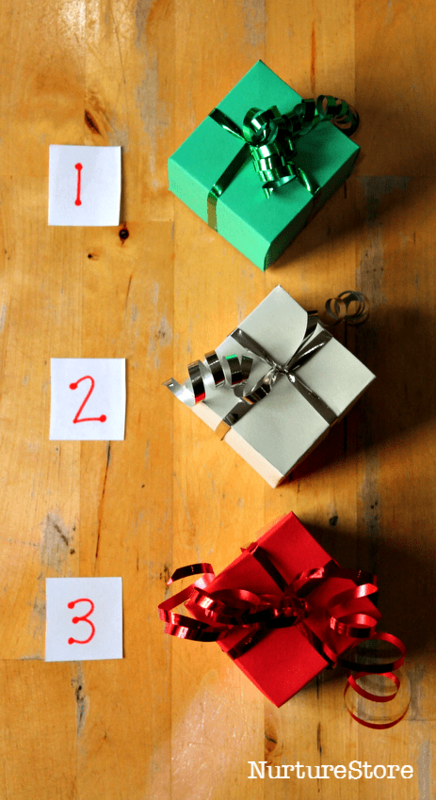 Take a guess: which number box are the jingle bells in? Take turns with your child to mix the boxes up and guess where the bells are hiding. :: Play ‘Pass the Parcel’. 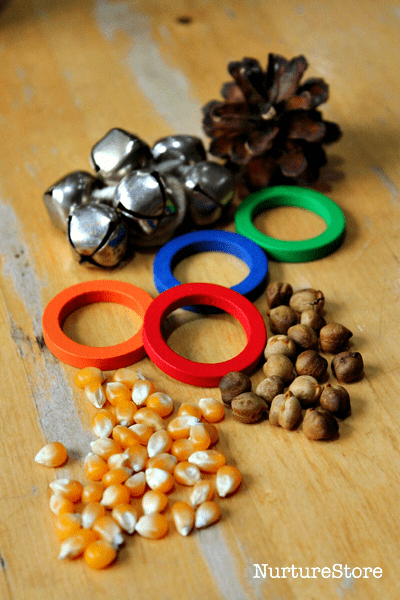 Sit a group of children in a circle and give one of them the gift box with the jingle bells in. Play some Christmas music and pass the jingle bell box around the ring from child to child as the music plays. 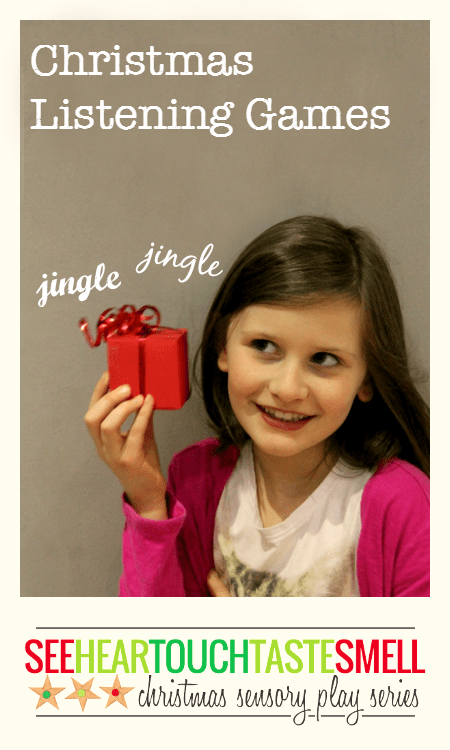 Stop the music and catch one child holding the jingle bell box. They can win a treat, take a challenge, answer a quiz question, or be ‘out’ of the game, whichever way you’d like to play. Turn the music on again, and play the game some more. Sit a group of children in a circle. Pick one child to be the guesser. Have this child close their eyes (perhaps covering their eyes with a mask or blindfold), and then give one of the other children the jingle bell gift box. Everyone in the circle sings the first few lines of ‘Jingle Bells’ and at the end the child holding the gift box gives it a little shake, so everyone can hear the bells. Can the guesser work out which child has the gift box? Everyone else will need to practise being very quiet, and the guesser will need to listen very carefully to hear which direction the jingle bells are coming from. You might need to give clues to help them narrow down which child has the bells. Once they work it out, someone else takes a turn to have the bells, and someone else gets to guess. I love that you made the boxes too! Fun activity! This is fantastic! Sharing, sharing, and sharing! Very engaging! The toddlers will be very excited, not only to listen, but to unwrap the boxes.